Designed for experimentation, not expertise. Chutney Challenged Gets Personal. Do You? 2. Their new lemonade donut looks intriguing and I like the concept, but if it’s not a vodka-lemonade donut then forget it. Infused custard in a donut is marketing genius! 3. Not everyone has watched the heinous, head-scratching “Dunkin Donuts Rant Goes Viral” video, proving that Internet memes do not reach every person within breathing distance of you. Context remains useful even in the Internet age. Well, I did watch that awful Taylor Chapman video. Her ripped-from-a-racist-reality-TV-show style proved her worthy of the harshest criticism leveled at her since she posted her eight-minute consumer rights manifesto last weekend. I was appalled by a couple things: her overall personality; her comfort level in wielding compound slurs that were both racist and misogynistic; AND, the cashier’s unfailingly polite demeanor as he tried to make amends for the night Neethi did not give Taylor a receipt. After the second f-bomb, I would have asked Taylor to leave until she cleaned out her mouth and dropped the “being under cellphone surveillance” business. At least I think I would. Our best imagined idealized versions of ourselves often are inspired in response to the injustices others face. “If I had been there…” I’m aware that such portrayals are not always accurate. Instead of getting more mad or getting even, I got a 25-count box of donut holes at my nearby DD the next morning. 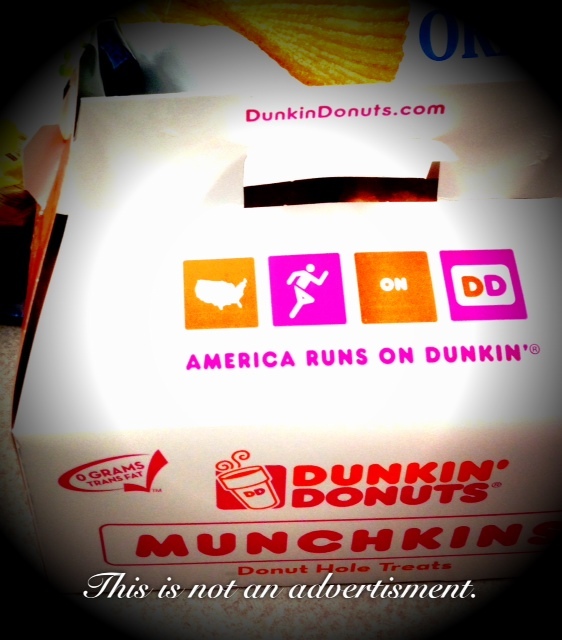 Though trademarked under the name “Munchkins,” I’m a little put off by that word and avoid it even in consumer conversation. Like the DD in Taylor Chapman’s internet-meme-turned-nightmare, my local DD is owned by folks who are from India. Besides the grocery store I frequent to buy my “Chutney Challenged” groceries and my living room, the airport-area DD is the only place on the south side where I’ve met other Indians and Desis. For this reason and because my skinniest child inhales DD’s bacon-egg-cheese wraps and mini potatoes, I often bring the kids there after sleepovers and such. Most folks have to read my kids’ names, first and last, to get any sense that they are multicultural. I don’t think my kids much care. I don’t think they need to. Multiculturalism need not have a “look,” nor must it be worn on any person’s sleeve. But when I visit their schools, classmates will ask me “Is your son really Indian?” “Is Child’s Name Here’s grandma really from India?” Both answers are yes, and my husband is not the step-dad. Nothing against step-dads. So, anyway, their background must be a topic of class conversation on some level. But one time, at the DD, the owner noticed two thin, patterned gold bracelets on my right arm as I handed her a $20. These are modest but unique bracelets my husband’s grandmother brought to me after our daughter was born. They’re so small that once I put them on, they rarely come off. “I like your gold,” the woman told me. She gently held my wrist and asked another woman to come and take a look (good thing this was not the first Friday of summer vacation). They conversed. Like a monolingual American, I can’t tell you if it was in Hindi or Urdu. She asked me where I got them. “My grandmother.” I am sure that within that transaction there was another moment of connection. But there were also other customers. We agreed to have a good day. This was two years ago. Two weeks ago I saw her for the first time not at the DD, but at the Indian grocery store. I tried to catch her eye, but I am not sure that she saw me. I’m not sure it matters either, but that doesn’t mean I won’t be dragging my kids to the the DD again soon, or to the neighborhood taqueria where they can flex their Spanish-language skills. I don’t know exactly how those kids of mine will turn out. Who can know this? But Internet-Video-Race-Baiters I’m sure they’ll never be. Hopefully this post makes folks hungry for equality and respect, not donuts! But if you are craving carbs, I always get great service and a receipt at the DD by the airport. Cinnamon is my favorite. Angela, I just wanted to tell you I greatly enjoy your blog. I am half Indian, with an Indian father the same as your kids. It can be an interesting way to grow up and I am often mistaken as Hispanic. My three kids are only a quarter Indian, but somehow the girls look more Indian than I do. Multi cultural families are a wonderful upbringing. My kids have 3 immigrant grandparents and I believe this will help them in all aspects of there lives. Thanks much for reading and responding Tara! Do we know each other? I think we might, in which case I amend what I said about southside Desis! And even if we don’t, it’s good to hear from someone else who’s been there. And is there, still. My eldest was born a red-head. Not sure my husband will every fully get over that surprise, but he’s lost all the orange now. Alas, we’re still buying sunscreen in bulk. My Irish complexion will always be with him, I’m afraid. Would you consider following Chutney Challenged? It's a great big world, and I'd love the company. Everybody Was Irish on Monday. Now What? See when I’ve posted and find posts you might’ve missed with this calendar. Covering Brewers greats from Hank Aaron to Eddie Zosky with beat writer Adam McCalvy.